We feature the best prices for Macintosh clock batteries, MacBook, MacBook Pro, iBook and PowerBook batteries! We discount for schools and quantity buyers, call for a quote. We sell batteries that you find in all Apple Macintosh computers and compatible systems, including UMAX, PowerComputing, Motorola and other Mac clones. We specialize in Mac batteries and buy in bulk, we are able to offer you the best prices! Batteries are fresh and kept in a special battery storage facility and our low price includes shipping!. We have illustrated instructions available for iMac Trayload and Slotload systems, available on request with purchase. All MacBook, PowerBook and iBook batteries come with a 30 day warranty from us and a full 1 year warranty from the factory! Our low prices include domestic shipping! MacBook, MacBook Pro, PowerBook and iBook power supplies also available. New Lower Prices on MacBook, MacBook Pro, iBook and PowerBook Batteries! Click Here to order MacBook, MacBook Pro, PowerBook and iBook batteries! Battery, Brand New, 1 year Warranty, 5000 mAH, 10.8V. Replaces these battery numbers: A1185, MA561, MA561FE/A, MA561G/A, MA561J/A, MA561LL/A, MA566, MA566FE/A, MA566G/A, MA566J/A, MA566LL/A. Our Price $92.77 includes domestic shipping. Our Price $119.77 includes domestic shipping. Our Price $109.77 includes domestic shipping. Battery, Brand New, 1 Year Warranty 6200 mAh 11.1V. 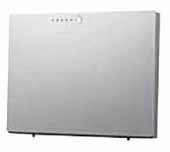 Fits the following models: MacBook Pro 17 inch, MacBook Pro 17 inch MA458G/A, MacBook Pro 17 inch series. Our Price $99.77 includes domestic shipping. Powerbook G4 12.1" Quality Replacement Battery. 4400 mAH Battery. New with 1 Year Factory Warranty. Apple equivalent replacement part numbers: A1022, M8769, M9572G/A, M9572, M8760LL/A, M8760, M8984G/A, M8984, M9324G/A, M9324, M9572J/A. Powerbook G4 15" Quality Replacement Battery. 4800 mAH Battery. New with 1 Year Factory Warranty. Apple equivalent replacement part numbers: A1045, M9325G/A, M9325. Powerbook G4 17" Quality Replacement Battery. 5400 mAH Battery. New with 1 Year Factory Warranty. Apple equivalent replacement part numbers: M9326, M9326G/A, A1039. Almost 1/3rd MORE POWER! 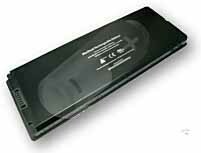 4400mAH High Quality replacement Ti 65 Watt Hour Battery for all Powerbook G4 15" 'Titanium' 400MHz - 1GHz Models. New w/1yr Factory Warranty. Up to 32% MORE Capacity vs. Apple's Battery! Upgrade or replace your original Apple PowerBook G4 15" Titanium battery today with a Replacement Ti 4400mAH high capacity battery today! Apple equivalent replacement part numbers: 661-2441, A1012, M6091, M8244 , M8244G/A, M8244G/B, M8244GA, M8244GB, M8511. SPECS: 14.8V, Li-ion Technology, 4400mAH, 65 Watt Hours. WAS $144.77 NOW $89.77 includes domestic shipping. 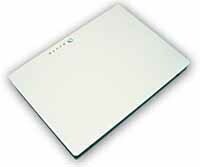 iBook (Late 2001, 2nd generation Dual USB - 12") High Capacity LiIon Battery - new, includes shipping! MORE CAPACITY than the Apple Original Battery. iBook "Dual USB" Replacement Battery 4400mAh. Upgrade or replace your original Apple iBook G3 12" "Dual USB" battery today with a 4400mAh replacement battery today! 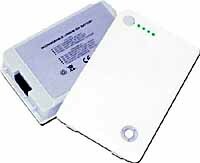 FITS: This battery is compatible with the following Apple iBook G3 12" Systems: iBook Dual USB - 500MHz, iBook (Late 2001) - 500/600MHz, iBook (16 VRAM) - 600/700MHz, iBook (Opaque 16VRAM) - 700MHz, iBook (32 VRAM) - 800MHz , iBook (Early 2003) - 800/900MHz. Apple equivalent replacement part numbers: 661-2472, A1008, A1061, M8403, M8433, M8433G, M8433GA, M8433G/A, M8433GB, M8433G/B, M8626G/A, M8956, M8956G, M8956GA, M8956G/A, M9337, M9337G, M9337GA, M9337G/A. 1 yr. manufacturers warranty. 4400 mAH. Was $129.77 NOW $119.77 includes domestic shipping. 4000 mAh quality affordable replacement battery Lithium-Ion, Laptop battery for Apple White iBook G3 & G4 14.1" series. Replaces Part #: A1062, M8416, M8416G/A, M8416J/A, M8665, M8665G, M8665G/A, M8665GA, M8860LL/A, M8862LL/A, M9165CH/A, M9165J/A, M9165LL/A, M9338G/A, M9338J/A, M9338J/B, M9388CH/A, M9388J/A, M9388LL/A. 14.4 Volts, 4000 mAh. Was $144.77 NOW $127.77 price includes domestic shipping. MORE POWER means faster charging! Power Adapter for Apple PowerBook G4 / iBook Dual USB / iBook G4 systems: This 60W AC adapter features dual voltage (100-240 volt) capability. It can recharge the Lithium-Ion battery while the system is off, on, or in sleep mode. It also powers the system if you choose to operate without a battery. Compatible with the following Apple PowerBooks: PowerBook G4, all models 12", 15" and 17", Apple iBook Dual USB (G3), Apple iBook G4 . The cord is 12' long from plug to plug. Our $39.77 including domestic shipping. 60W Power Adapter for all PowerBook G3 (all models)/iBook G3 Clamshell Systems! includes shipping! MORE POWER! Recharge your G3 faster! Replace your Yo Yo with more power. Power Adapter for Apple PowerBook G3 / iBook G3 Clamshell systems: This 60W AC adapter features dual voltage (100-240 volt) capability. It can recharge the Lithium-Ion battery while the system is off, on, or in sleep mode. It also powers the system if you choose to operate without a battery. Compatible with the following Apple PowerBooks: PowerBook G3, all iBook G3's Clamshell (not Dual USB). The cord is 12' long from plug to plug. LOWER SALE PRICE $49.77 price includes domestic shipping. Click Here to order MacBook, PowerBook and iBook batteries! Order securely from a 26 year old company who specializes in quality refurbished Mac and Mac clone computers. We offer a 30 day warranty on all batteries and FREE SHIPPING in the continental U.S. Manufacturers warrantys are generally one year. We accept SCHOOL and Institutional P.O.'s! Recycle your old Lithium iBook and PowerBook batteries by dropping them off at Radio Shack, Office Depot, Sam's Club, Walmart, Lowes, Home Depot, AT&T Mobility and other sites in your area. Never discard them in landfills. Macintosh, Apple and the Apple logo are registered trademarks of Apple Computer.